Plants require many nutrients the main ones being nitrogen, phosphorus(in phosphate) and potassium(in potash). Each of these ingredients can be bought separately, but most gardeners prefer to use general fertilizer containing all three such as Growmore. It contains seven percent nitrogen,seven percent phosphorus and seven percent potassium. The ingredients are sulphate of ammonia, superphosphate of lime and solphate of potash. Another popular general formula is John Innes base fertilizer containing hoof and horn manure, superphosphate and suphur of potash. The analysis is 5,1 percent nitrogen 6,4 percent phosphorus and 9,7 percent potassium. Fertilizers can also be applied to the roots of a plant as a liquid for quick absorbtion. Liquid fertilizers can be bought as abalanced feed for general purposes or as special mixtures for particular plants. General fertilizers are also sold as foliar feeds-liquids which are absorbed quickly through the leaves when applied with a watering can. 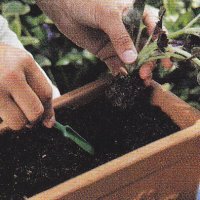 Most plants in planters are grown in potting mixes with little or no nutrients in them when that is the case then the gardener must provide the necessary fertilizers for good plant growth. Choosing the correct fertiliser: Whether you are using a natural fertiliser, or an artificial one, make sure you are treating your plants properly. For example, are you remedying a general soil problem, or feeding a particular plant to make it flower more profusely? Once you've decided which fertiliser to use, you have several ways to apply it. Feeding trees: The spread of tree roots is more or less equivalent to the spread of the branches, which means that the absorbent roots will usually be well away from the trunk, at a point directly below the outer limits of the branches. Apply feed in this area. If the soil is compact, make fork holes in the ground and water in the application. If space allows it is a good idea to keeep two compost heaps or bins on the go at the same time. This will ensure a constant supply of of compost as material can be rotting down in one while you are still filling up the other. Feeding shrubs : Spread the fertiliser around the base of each plant and rake it into the top 2-3cm of soil. 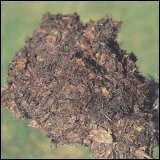 Unless the soil is very wet, always water in the feed. Foliar feeding: Spraying a dilute Liquid fertiliser on to the leaves of plants is a quick and effective way of direct feeding, particularly during periods of dry weather when the roots are less active. Foliar feeding is a great tonic for struggling plants and will give them a quick boost, but don't do it when the plant is in direct sun. Flowerpot special: Flowers in planters need extra nutrients to grow and bloom well, as the plant quickly uses up the goodness in the small amount of soil in the planter. Feed regularly or push modern, controlled - release fertiliser pellets into the soil around plants. This will provide all the nutrients the plant needs for up to six months.